for all correct reception reports received up to the end of 2009 for "Radio EDXP" programs hosted by various international shortwave broadcasters. The full colour QSLs show Australian scenes and wildlife, and indicate the actual transmitter location and the name of the host broadcaster. Adventist World Radio worldwide network, every month, during the "Wavescan" program, on weekends. This may be heard over transmitters in Guam, Germany, and WRMI. Report Template. You "pick up" your E-QSL at a special Website after you have received an E-mail notification from EDXP. EDXP administration. Most members reside in Australia. into its 14th year of continuous operations. Good listening to Radio EDXP, and your reception reports would be appreciated! The classic Pacific Asian Log of mediumwave [AM] radio stations on air across the entire region has now been updated at www.radioheritage.net. so it's accurate and up to date. You can search the database or download a pdf version for your own non-commercial use by visiting www.radioheritage.net/PAL_search.asp today. Amongst the stations you'll find on 1602 AM are 2CP Cooma [Australia], All India Radio, Ziro [India], JOKC Kofu [Japan], HLQE Sabuk [South Korea], Radio Reading Service, Levin [New Zealand], and DZUP Quezon City [Philippines]. The most powerful station listed in the region is 50kW Radio Khost, located in Afghanistan. You'll find the Pacific Asian Log Radio Guide useful for business and vacation travel [just print out the stations from the countries you're visiting], radio monitoring, advertising and PR campaign media planning and much more...it's up to date and it's free. The Pacific Asian Log traces its origins back to radio station call lists first published in New Zealand during the 1930's, and is volunteer supported and produced as a free service for everyone. If you'd like to make a donation towards upgrading today's Radio Guides with even more information please use your VISA or Mastercard this holiday season and click on the donation button at www.radioheritage.net. The Shortwave Report 11/21/08 Listen Globally! This week's show features stories from China Radio International, Radio Netherlands, Radio Havana Cuba, and the Voice of Russia. From CHINA- The Chinese President is visiting Cuba and other Latin American nations, signing cooperation and trade deals- he also delivered significant aid to Cuba for hurricane relief. China announced energy conservation plans as a means of reducing climate change. China has denied that it plans to send troops to Afghanistan, though it has peace keepers in the DRC. Rebels in the DRC appear to be pulling back as promised, but refugee camps remain full. The Israeli transportation minister has called for targeted killings of Hamas members in Palestine. The UN is looking at the growing problem of pirates off the coast of Somalia. From NETHERLANDS- Radio Netherlands has eliminated shortwave broadcasts to North America. The decision is based on their surveys that find very few listeners in N America. 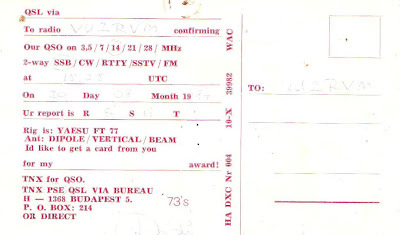 If you ever listen to RN on shortwave, please let them know- by email to letters [at] rnw.nl or send them a letter to Radio Netherlands Worldwide, PO Box 222, 1200JG, Hilversum, The Netherlands. The Indian Navy sunk a Somali pirate ship on Wednesday, and the EU is developing a military operation to protect ships in the region. After a brief opening, Israel resealed the borders of the Gaza Strip despite severe food and fuel shortages- Palestinian fishing boats are being attacked by the Israeli Navy. From CUBA- Cuba has signed a number of trade agreements and loan deferrals with the visiting Chinese President. Bolivian President Evo Morales addressed the UN, saying that neo-liberalism and capitalism were responsible for the global economic crisis. A retiring Law Lord in England has described the invasion of Iraq as a serious violation of international law, and many in Parliament are seeking an independent inquiry into the events. From RUSSIA- A commentary on Barack Obama's development of a national security team and policy, and his hopes to restore America's moral stature in the world. --"I like the dreams of the future rather than the history of the past." DebreTsion is in charge of the Ethiopian Information & Communicatiion Technology Development Agency, but his main job is to block most Ethiopians from having access to information. The Meles dictatorship in Ethiopia has jammed a radio program that was being broadcast to Ethiopia from Europe by the Ginbot 7 Movement for Freedom and Democracy, according to Ethiopian Review sources in Addis Ababa. Voice of Ginbot 7 was launched on September 11, 2008, and had been heard through out Ethiopia and most countries in eastern Africa. Similar attempt by the Woyanne regime to jam the Voice of America (VOA) Amharic program had been successful only for a few days. The VOA countered by running its program on multiple frequencies, each with 500 kilowatt, making it too expensive to jam them. VOA's transmission power can go up to 100 megawatt per frequency when supplemented with powerful antennas. According to experts, it costs up to U.S. $10,000 per kilowatt to jam a radio program. To build and operate a facility that is capable of jamming multiple frequencies with 100s of kilowatt each, the Meles regime could be spending tens of millions of dollars. This is the money that could have been used to feed and cloth so many of Ethiopia's starving children who are unable to attend school because they are too weak from hunger. Sources inside ETC say that the facility that the Chinese built for the bloodsucking Woyanne regime can jam frequencies only up to 100 kilowatt. The Meles dictatorship is also unable to jam Eritrean Radio's Amharic Service, which uses both Short and Medium wave frequencies. The jamming of radio programs and blocking access to web sites that are deemed critical of the dictatorship in Ethiopia is being carried out by Ato DebreTsion GebreMichael, a central committee member of the ruling Tigrean People Liberation Front (TPLF) and a protoge of Meles Zenawi. Ato DebreTsion is chairman of the Ethiopian Telecommunication Corporation (ETC) and Director General of the Information and Communication Technology Development Agency (EICTDA). His main assignment, however, is not the development of information technology in Ethiopia. His primary objective as Ethiopia's chief IT officer is to restrict access of such technology to most Ethiopians. He has been good at it. Under his watch, out of 80 million Ethiopians, only 2 million use mobile phones. There are only 20,000 internet service subscribers in Ethiopia  the lowest in Africa. BBC World Service and Deutsche Welle have announced plans to launch a joint radio service to Europe on DRM shortwave. The new stream, which will be entirely in English, is expected to go live in early 2009. It will be available from early morning till late at night targeting Western and Central Europe and a potential audience of 170 million listeners with global news and current affairs and a rich mix of in-depth analysis, documentaries and cultural programs. The service will provide a multimedia offer of audio and text, the latter coming automatically from the BBC News website. Erik Bettermann, Director General at Deutsche Welle, said: "It is great that two of the world's most established broadcasters can work together on a project of this scale. This is an exciting venture that will offer European listeners top class content and provides the perfect opportunity to reintroduce listeners to DRM." 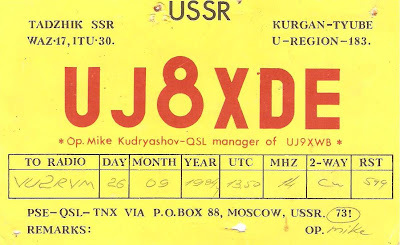 Media Network contributor Christopher Lewis reported this morning "0858 UTC. I am currently listening to BBC and DW Test (the text as appeared on the display) on 9610 kHz DRM. I am not sure where the transmission is being relayed from, but signal is steady, with stereo audio. Programming is featuring reports about the environment, agriculture, sciences etc. Test continues at 0900 on 9610 khz, opening with a bulletin of DW news in English." In fact, the transmission on 9610 was from Sines, Portugal. In the DRM Sofware Radio Forums, the complete schedule is given for the tests which will continue at 0500-2300 UTC today, tomorrow and Thursday. There are also tests scheduled on mediumwave 1296 kHz at 0500-0700 and 1700-2300 UTC. Visit below for the full schedule. An independent TV channel featuring sports will be launched in summer 2009, said the deputy head of Islamic Republic of Iran Broadcasting (IRIB) TV. Speaking to Morteza Mir-Baqeri added that the channel was earlier scheduled to become operational this year with the support of the Majlis and government. However, this did not happen and the initiative was delayed until the next year. The channel will cover all sports programmes, and if they exceed in number other channels will also air sports programmes, he said. The sports channel will work around the clock, he said. Mir-Baqeri also said that channels currently broadcasting sports programs will focus on social ills and youth affairs. Ghanaian regulator told to "stop radio stations from transcending their boundaries"
A project consultand, Nii Tackie Otoo, has called on Ghana's National Communication Authority (NCA) to enforce its regulations that prevent radio stations broadcasting beyond their boundaries. He said some radio stations were broadcasting beyond their boundaries because certain aspects of the NCA regulations, LI 1719 of 2003, were not proactive [sic]. He was speaking at a one-day workshop on "Radio Stations Broadcasting Beyond their Boundaries" organised by the Western Salem Communication, operators of Kyzz Fm, and the Business Sector Advocacy Challenge (BUSAC) Fund in Takoradi. Nii Otoo said the regulation should be reviewed to ensure that radio stations that broadcast beyond their boundaries face stiff sanctions. The framework of the law, he said, must ensure a level playing field and fairness in the industry because well-established radio stations were overshadowing small ones. He suggested that radio stations and the NCA signed a memorandum of understanding so that the Authority could be held accountable when its regulations were flouted. Andy Sennitt comments on http://blogs.rnw.nl/medianetwork/: This displays a lack of understanding about the basic laws of physics and insufficient technical planning. By definition, a radio station's coverage area cannot have "boundaries". The signal can't be turned on and off like a tap. What's needed is a licence which specifices a primary coverage area, and the required transmitter power calculated accordingly. It may be that a lack of regulations and/or monitoring and onsite inspections have led to some stations using transmitters which are far more powerful than they need to be. However, just because a station may be received well beyond the area for which it is licensed, that doesn't necessarily mean that it has flouted any regulations. Hopefully, the situation can be resolved without forcing stations off the air or making them pay crippling fines. My story on AC3PT was widely appreciated and it was something new to the people of Sikkim too. But little did I know that there was one person in the entire crowd who was closely watching my article and he too had been part of Sikkim Ham radio activity. Meet Rajesh Verma, Director, Department of Information Technology, Government of Sikkim. Rajesh Verma is better known in Sikkim for his well-liked Guide book on Sikkim. 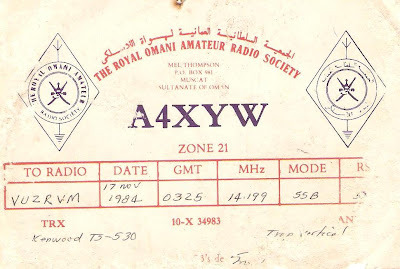 Nevertheless there are few people who really know that he was also an active radio ham with a call sign VU2RVM and he had also written a book on ham radio. 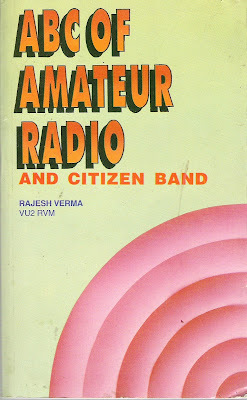 His book “ABC of Amateur Radio and Citizen Band” was first published in 1987. It was more of an opportunity for me to have a swap over of emails with Rajesh Verma. 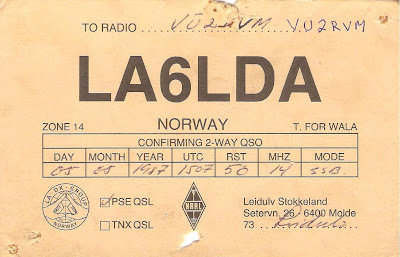 I shall also remain ever grateful towards him for his book that he sent me along with his personal call sign QSL card. 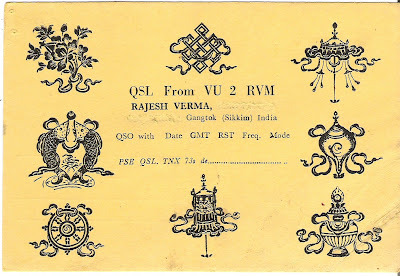 I am here sharing his call sign QSL card that shows eight lucky sign of Buddhist culture along with other different QSL cards he had received over the years. What is more interesting is the piece of information that when Sikkim was an independent kingdom, Sikkim had a call sign AC3 followed by PT named after late Chogyal (King) Palden Thondup Namgyal. Post 1975 after Sikkim got merged with mighty Indian Union, the next call sign licensed was VU2RVM i.e. VU2 for India and RVM the person's name. Media groups in Sri Lanka, already restricted from covering the war against Tamil rebels in the north, are bracing to challenge new regulations that seek to control television broadcasting and new media, Inter Press Service reports. The new rules, announced on 27 October, control content not only for broadcast but also MMS (Multimedia Messaging Service) on mobile phones. Newspapers reported government plans to bring in similar rules for radio broadcasting. "Censorship, there is no doubt about it," said Sunanda Deshapriya, spokesman for Sri Lanka's Free Media Movement (FMM), an association representing journalists, publishers and private broadcasters. He said media groups and civil society organisations plan to challenge the regulations in the Supreme Court before 10 November, the deadline for objections before the regulations take effect. The new regulations provide the Media Minister with powers to cancel licences if content is "detrimental to the interests of national security; incites a breakdown of public order; incites ethnic, religious or cultural hatred; is morally offensive or indecent; is detrimental to the rights and privileges of children", among other restrictions. The government has defended the new regulations. The Media Minister, Anura Priyadharshana Yapa, said they were needed to bring about uniformity in the fast-growing electronic media broadcasting field. The state-run radio Pridnestrovye in Moldova's breakaway Dniester region has cut its broadcasts from 23 to a bit more than three hours a day due to the lack of proper office space, the eponymous Dniester official daily reported on 5 November. The paper said that because of the last summer's floods the station's radio equipment and personnel were evacuated from its premises in central Tiraspol, but no new office place has been allocated to it so far. The radio channel's equipment is stored in a garage, and journalists work at a canteen of the breakaway region's information ministry. While information minister Vladimir Belyayev is still in the process of making a decision whether to repair the station's old premises or to find a new office for it, 100 out of the station's 146 staff members have been sent on an open-ended leave, with their wages cut by 30 per cent. Commenting on the radio station's critical situation, the Russkiy Proryv! weekly said on 5 November that the situation was aggravated by disagreements between the Dniester parliament and the information ministry. According to the law on the state-run media in the Dniester region, all official radio and TV channels should list parliament and the president as founders, but the ministry took upon itself all managerial functions over the Pridnestrovye radio channel, the weekly said. It recalled that in 2007, parliament initiated a probe into the ministry's activities linked to the radio station and unveiled numerous violations, including money-laundering. Members of the Dniester parliament tabled a proposal then that the radio station sign a separate agreement with president Igor Smirnov and radio Pridnestrovye become answerable to parliament, the paper said. Oct 4 YL and OM with news items from China. singing 0006 in Japanese. YL interviwming an OM 0008. Oct 4 YL with comments. MacKenzie-CA. MacKenzie-CA. otherwise a noist frequency. MacKenzie-CA. 433 Oct 7 YL and OM with comments. YL with an ID at 0245.
comments then some more pop music. // 7125 Moldova. Culture and Language Come Alive"
YL interviewing an OM. Mackenzie-CA. YL comments on Italy's usage of Euros within Italy. 0328. Bells at village weddings culture by a YL. followed by a YL with comments. Spanish 444 Oct 4 YL and OM with ongoing comments. Oct 4 Two OMs with comments. MacKenzie-CA. 4444 Oct 4 YL interviewing an OM. MacKenzie-CA. Spanish 444 Oct 4 OM with comments. MacKenzie-CA. world's financial crisis. //7280 Shepparton. RFA, 9540 RFA, 9865 RFA and 11540 RFA. Two YLs with comments, then an OM interviewinga YL. ship is surrounded the Navy. 1 Two YLs chatting with each other. MacKenzie-CA. Oct 1 YL talking to an OM. MacKenzie-CA. Received the following msg from Voice of Mongolia. The Mongolian National Radio in cooperation with the National Council for Foreign Advertisement and Cultural relations is announcing a radio quiz "Who better knows Mongolia"
The quiz is announcing for a period of two months starting from September 15 until November15. The entries for the radio quiz would be considered by a joint selection commission of the above two organizations and names of winners would be announced on December 1. Here are the questions of the radio quiz "Who better knows Mongolia"
1. What do you know about the territory, population and national minorities of Mongolia? 2. Since when Mongolia has been participating in the Olympic Games? How many Mongolian athletes and in what categories took part in the 29th Summer Olympic Games in Beijing? How many medals Mongolia won and what were the categories? 3. Some cultural and natural heritages of Mongolia are included in the UNESCO World Heritage List. What are they and why they had been put on the UNESCO list? Three best entries would be selected to be awarded and there would also be two special prizes. So tune to us, take part in the quiz and be a winner! Pleased to inform that Radio Veritas Asia (RVA), Philippines, has started SMS service for its Bengali listeners. Now SMS can be sent in the following Kolkata based mobile phone number regarding RVA Bengali programme & "Chetana" programme / project related issues. Voice call is not allowed. At the end of this month, on the 26th of September, Europe will be celebrating linguistic diversity and lifelong language learning. We want you to identify this European language. This excerpt is the poem "The knight in the panther's skin", a 12th century epic depiction of this country, which has also been in the news again recently. To win an MP3 player or another great prize, you need to be in the running, so email us your answer to europe@dw-world.de or write to us the old-fashioned way to European Desk, Deutsche Welle, Bonn, Germany. Good luck! A new presenter, Ms Ritika Rai has joined DW Radio-Hindi for two months perhaps.She worked as News Presenter & Producer etc in Doordarshan before joining DW Radio-Hindi. She gave her introduction in last sunday's Aap Ki Bari Aap Ki Baat , the mailbag programme of DW Radio-Hindi. I understand DW Radio-Hindi is also giving away exciting prizes each day for those who visits their website. There will be some prize info etc hidden on a page or pages of website. One can win those/this each day by finding the place & then send the necessary info perhaps to DW Radio.Believe there will be popup instructions there as soon as you find the link where the prize info is hidden. Ever since 1938 Radio Sweden has served as an important link between Swedenand the rest of the world. On Wednesday, September 3 we'll be celebratingour 70th birthday with special broadcasts, a panel discusion, and livemusic.Our first English broadcast of the day, at 12:30 hrs UTC, will be a liveprogram from Studio 5 at Broadcasting House in Stockholm. We'll be taking alook back at some of the major stories we've covered over the years, andtalking with many guests, including some wellknown Radio Sweden voices fromthe past.That will be followed by a special panel debate in Swedish with a number ofcultural and media personalities.The 14:00 hrs UTC Swedish broaadcast will also be live from Studio 5.The entire special program, from 12:30 to 16:30 hours UTC, will be carriedlive in a special web broadcast.So don't fail to join us to celebrate our 70th, Live from Studio Five. Pakistan will change their local time in November 2008 from DXAsia News Aug 29, 2008 (23 hours ago) The government of Pakistan has decided to postpone the change of local timings untill the first week of November - so VOA Urdu service will continue to use the present timings and frequencies till the end of A08 schedule period. The current schedule is :MW 972 1539 kHz is available at 1300-0100 hrs.SW service 0000-0100 on 7135 11755 kHz.SW service 1300-1400 on 9340 15795 kHz. Two OMs in a conversation with a noisy background. > some music. QRM via the Voice of Russia on the same frequency. with comments and then Turkish music vocals by a YL. Mackenzie-CA. time around. //9355 . MacKenzie-CA. Vocal Music then an OM with comments. > plus an IS. MacKenzie-CA. comments plus an OM. MacKenzie-CA. > the VOA IS and ID in English and off the air at 2100. KUWAIT Radio Kuwait 11675 0315 Arabic 333 Aug 23 OM with comments. > YL with comments on the use of drugs since the 1960's. > interviews at the 2008 Olympics. MacKenzie-CA. 2872 kHz USB 0452z: Gander wkg "Air India 140" for position report. 2872 kHz USB 0454z: Gander wkg "Continental 94" for position report. 2872 kHz USB 0507z: Gander wkg "Speedbird 208" for Selcal check. 3016 kHz USB 0542z: Santa Maria wkg "Reach 55" for position report. 3016 kHz USB 0549z: Shanwick wkg airliners for position reports. 3455 kHz USB 0503z: New York wkg airliners for position reports. 5550 kHz USB 0502z: New York wkg airliners for position reports. 5598 kHz USB 0526z: New York wkg "Iberia 401" for routing, climb to FL370. 5598 kHz USB 0527z: New York wkg "Speedbird 252" for position report. at various locations: Victoria, Comox, Thule, etc. (27Aug2008) (ALS). that operates nationwide via satellite and cable. FEBC has received a license to start Christian radio stations in Kazakhstan. Kazakhstan (MNN) ― The lower chamber of Kazakhstan's parliament has passed new legislation that would impose tough new restrictions on foreign missionary activity and evangelical churches. The measure had its first reading in May. However, this new bill isn't stopping Christian radio from entering the country. Gregg Harris, president of Far East Broadcasting Company, says he is surprised, but he thinks he knows why the activity of FEBC is unaffected. "We work as a nationally registered entity. In other words, we don't come into the country as an outsider. We have an FEBC entity registered inside the country. And that makes a great deal of difference at a time like this when the government is beginning to clamp down and curtail what they perceive to be foreign missionary activity." Harris says they have big ambitions. "We're hoping to open and operate two FM radio stations in Almaty and Astana. We have been granted the broadcast license, but we don't have the specific frequencies yet to actually open the stations and actually go on the air." He's uncertain when that will happen. "You can wait just a few weeks. Sometimes it can take months, and unfortunately it can take years. We have already been in these discussions for about two to three years, and we're hoping that something is going to happen very soon." While they're still some time away from going on the air, Harris says they're moving forward with 24-hours-a-day programming. "We're going to stream it on the Internet and make it available for those in the country that have Internet access, so that we can begin showing the government that we're serious [and] that we're making good programming." FEBC will be providing programming to meet changing needs in Kazakhstan. "Surprisingly, more people in Kazakhstan speak Russian than they speak Kazakh. But there is a growing nationalistic trend in Kazakhstan that means the Kazakh language will become more and more used and more and more influential." Harris adds, "Our programming will be a mixture of Russian programming, but we will also be making Kazakh for those who are Kazakh speakers." Harris is asking Christians to pray that "the government would move ahead, would grant us the frequencies so that we can begin raising funds and actually physically build and operate the station." The lower chamber of Kazakhstan's parliament has passed new legislation that would impose tough new restrictions on foreign missionary activity and evangelical churches. The measure had its first reading in May. However, this new bill isn't stopping Christian radio from entering the country. President of Far East Broadcasting Company Gregg Harris says he is surprised. But he thinks he knows why. "We work as a nationally registered entity. In other words, we don't come into the country as an outsider. We have an FEBC entity registered inside the country. And that makes a great deal of difference at a time like this when the government is beginning to clamp down and curtail what they perceive to be foreign missionary activity." Harris says they have big ambitions. "We're hoping to open and operate two FM radio stations in Amity and Astana. We have been granted the broadcast license, but we don't have the specific frequencies yet to actually open the stations and actually go on the air." Caracas says it plans to launch its first satellite from China in November to boost its telecommunications and broadcast capabilities. Venezuelan President Hugo Chávez made the announcement in his weekly television programme, adding that the satellite, named after South American independence hero Simon Bolivar, will cover several Latin American countries. The satellite to be launched from China's southwestern Sichuan province on 1 November will make Venezuela self-sufficient in television, Internet and other communication transmissions, he added. China is to launch Venezuela's first satellite in November which will serve to relay telecommunications data and television signals over Latin America, President Hugo Chavez said. The orbiter, named "Simon Bolivar" after a 19th century Venezuelan independence hero, was built under contract by a Chinese firm and will be sent into space on November 1, Chavez said in his weekly radio program on Sunday. He added that his country planned to have China put a second, reconnaissance satellite above Earth in 2013. Chavez, Latin America's leftwing firebrand and a fierce critic of the United States, has recently embarked on a spending spree of Russian weapons and military aircraft. Uruguay, which ceded the geostationary orbit position above Ecuador to Venezuela for the November launch, will have a 10-percent share in the Simon Bolivar satellite and use of its functions, Venezuelan Science Minister Hector Navarro said in April. "This launch is a further step towards sovereignty. 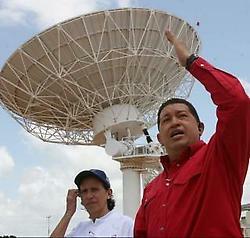 The Simon Bolivar satellite implies a transfer of technology and the use of communications for the people," Chavez said. Mérida, August 18, 2008 (venezuelanalysis.com)-- Venezuela's first satellite will be launched from Chinese soil on November 1st, President Hugo Chávez announced on his weekly Sunday talk show Aló Presidente, which was broadcast from the satellite control station located at an air base on the vast plains of the state of Guárico, Venezuela. The satellite is the materialization of the technology transfer agreement initiated by Venezuela and China in 2004, which Chávez said is an example of South-South cooperation. "Venezuela's Simón Bolívar Satellite, with the incomparable help of sister China, will soon be launched. November 1st, that is the date," said Chávez, who was accompanied by Chinese Embassador to Venezuela Zhang Tuo. The satellite, which is named after South American independence leader Simón Bolívar, will serve primarily civilian telecommunications purposes, according to Venezuelan Telecommunications Minister Socorro Hernández. "It is a fundamental tool for technological sovereignty that will be put at the service of the population," said Hernández, who also accompanied Chávez Sunday. According to the minister, the satellite will help improve the quality and geographical reach of government social programs through televised health and educational services. The satellite will also serve the needs of the social organizations and communities, with social ends in mind, Chávez emphasized. The Venezuelan Communications and Information Minister, Andrés Izarra, pointed out that entering the space community will boost Venezuela's television industry. The "Aló, Presidente" presidential talk show is currently transmitted from a Dutch satellite, but "will now be offered with our own satellite," he said. The Venezuelan government contracted a Chinese firm to carry out the design, manufacture, and launching of the satellite, according to the Aló, Presidente website. CANTV, Venezuela's National Telecommunications Company that was nationalized in early 2007, will manage the satellite's telecommunications spectrum. The Science and Technology Ministry will administer the control center in Guárico state and the backup control station in southeastern Bolívar state. Uruguay has agreed to open its orbit to Venezuela's satellite in exchange for the use of 10% of the satellite's telecommunications spectrum. As part of the technology transfer agreement with China, a team of 150 Venezuelans were trained in space technology, along with 30 Venezuelan students who were selected to complete their doctoral studies in the subject in China. "Venezuela is expanding, growing from all points of view," Chávez boasted. He also announced his plans to travel to Beijing in the coming months to "give another boost to the strategic alliance between China and Venezuela." Venezuela's relations with China already include contracts for the joint extraction of Venezuelan crude oil and gas, construction of Venezuela's railroad system, a credit line for Venezuela to purchase Chinese agricultural equipment, and a joint development fund constituted with $6 billion in capital, $4 billion of which came from China, among other agreements. Two YLs with ongoing comments. MacKenzie-CA. English 333 Aug 11 OM interviewing an OM on the 2008 Olympics. MacKenzie-CA. 333 Aug 17 YL and OM in a happy conversation with each other. REE ID and more co9mments. //9535 via Spain. MacKenzie-CA. OM with comments and some music. MacKenzie-CA. 333 Aug 17 YL with comments plus another OM at times. conflict between Russia and Georgia. more comments by an OM. MacKenzie-CA. with comments. //15540 via Bonaire. MacKenzie-CA. Chinese style music. //11750 . MacKenzie-CA. comments 0302. //11680  and 9600 . Two OMs with comments. MacKenzie-CA. English 333 Aug 11 YL with comments on a bank robbery. people were killed and dozens injured. Broadcasts went on in secret for several days, keeping the world informed of what was really happening, initially from within the building itself, and then from other locations in the city, using mobile studios and transmitters. Prague at such an extraordinary moment. “No, they didn’t at all and nor did I, obviously, and I was very politically naïve. I was 24 years old in 1968 and really had very little knowledge of what could happen walking into a communist country at the time. We drove here and crossed the border about five days after the invasion, and there were tanks quite visible. We arrived in the dead of night and I wondered what on earth I had come to. It was very dark and bleak, and actually in the first couple of nights you could hear tankfire or gunfire, there were still some skirmishes going on until things settled down a bit. Prague and there had even been fighting outside this building. tighten and many people were sacked. Do you remember that time as well? They must have been a little worried…. We are now sitting in a studio in the new radio building, which is just behind the old building where you were working. This is all very hi-tech and modern. It must have been quite different in the late ‘60s. You certainly don’t sound like the Queen now! atmosphere seems to have been very relaxed. didn’t go back home immediately. “No, I didn’t leave Czechoslovakia until probably the spring of 1970. Eventually you decided to leave. At that time were you still with your Czech-English boyfriend? And you didn’t follow a career in broadcasting. You studied law. So, Liz Skelton, thank you very much indeed for coming back into the studio after all these years. It’s been a real pleasure to talk to you. And if any of our listeners happen to have recordings of our broadcasts from late 1968 or 1969 at home, do have a listen, and if you do come across Liz Skelton’s voice, we’d be delighted if you could send us a copy. Recently a group of communications experts and practitioners met in Accra on how both traditional and new media can be harnessed to promote development. Prof. John DowNing co-founder of OURMedia, global network which facilitates dialogue between media academics and practitioners underscored the connection between media and social movement of people who have the same interests and values to protect. Equally important was the suggestion by Prof Alfred Opubor that the syllabi taught in African universities and communications institutes should be changed to perhaps, reflect the growing need to use communication as a developmental tool. Though the contribution of media economic output mostly in Africa and even in some parts of the world has not been massive, the media remain useful tools in promoting high productivity. Bruce M. Owen in his article "Media as an Industry: Economic Foundations of Mass Media argues that the availability of commercial information contained in advertising greatly reduces consumers' transaction and search costs and creates the possibility of mass marketing, with its economies of scale. Similarly the dissemination of commercial information, like commodity prices and wage rates facilitates productivity in small scale enterprises. Mass communication, he says also serves political, cultural and educational ends. This explains why in the more matured democracies a very crucial role has been fashioned for the media. In fact the western media are part of the economic system that is pushing the globalisation agenda. Herman et al in "The Global Media: The New Missionaries of Corporate Capitalism:, argue that western media systems have tended to reflect the patterns of the overall system of the west. The global, the add provide the main vehicle for advertising corporate wares and ideas and facilitate the expansion of western corporations into new markets, nations and regions. Radio for instance, has been used as a very potent channel of education and economic growth in the west, not forgetting the role radio played in the colonization of Africa. The United States for instance won the cold war largely due to the 'productive' use of Shortwave radio. Radio Free Europe and Radio Liberty funded by the United States government churned out western propaganda against the former Society Union and Cuba. So dominant were these radios that they became the lifeblood of many citizens of Cuba, the Soviet Union and its former Eastern European allies purportedly fighting to liberate themselves. To date the US and Britain still use the VOA and the BBC to pursue their foreign policies. Unfortunately for us in Ghana, the Ghana Broadcasting Corporation has bailed out of the Shortwave broadcasting which has a wider reach than FM. How Latin American and Asian countries used and continue to use radio as a driver of economic development has been well documented. They saw the spectrum as a national resource that should be harnessed for national development and they did. The purposeful use of communication as catalysts for social development gave birth to what is now commonly referred to as development communication. What we have lacked in our development discourse is the non utilization of existing communication tools and applicable theories for result-driven strategies for the advancement of society. Development communication in Asian and Latin America is greatly linked with the concepts of Sustainable Development (which can be defined as the improvement of a community using information and technology and the community's ability to maintain the created ideal state without compromising its environment and resources). It also relies greatly on Community and People Participation, which is the voluntary involvement of a group of people in a development activity with full knowledge of its purpose that will allow them to grow individually and as a community. Development communication is the process of eliciting positive change (social, political, economic, moral, environmental, etc) through an effective exchange of pertinent information in order to induce people to action.1 Our media landscape doesn't give room for the utilisation of communication to achieve set goals, safe for promoting parochial interests. The call by Prof. Opubor for change in the syllabi of our communications institutions is forthright. 1. 1 ^ Quebral, Nora C.
(1973/72). "What Do We Mean by 'Development Communication'". International Development Review 15 (2): 25–28. Our euromaxx quiz is simple. All you have to do is examine four pictures and answer a simple question. If you've got the answer just drop us a line and you could be the winner of a designer wristwatch made in Europe. We eagerly await your entry (one entry per person per e-mail). Include your answers in the e-mail text, but not as an attachment. There is no legal recourse. This week's quiz is about the 50th anniversary of a famous designer brand from Denmark. A renowned Danish designer is celebrating the fiftieth anniversary of his brand. His products are known for their clear lines and minimalist design. They range from exclusive hi-fi systems for the sophisticated listener -- everything from turntables to loudspeakers -- to kitchen accessories -- from designer mixing bowls to the finest porcelain -- all the way to clocks and watches. And now to our question: What well-known Danish designer label is celebrating its fiiftieth anniversary? Bildunterschrift: Großansicht des Bildes mit der Bildunterschrift: Jacob Jensen? Bildunterschrift: Großansicht des Bildes mit der Bildunterschrift: Borge Mogensen? Bildunterschrift: Großansicht des Bildes mit der Bildunterschrift: Arne Jacobsen? Bildunterschrift: Großansicht des Bildes mit der Bildunterschrift: or Verner Panton? You can also send a fax to: +49-30-4646 6505. The deadline is August 29nd. Please remember to include the keyword! And, as always, our decision is final. The winner will get a men's watch from the Spanish firm Festina. And three weeks ago we asked where this year's Manifesta is taking place. The answer was picture A - South Tyrol. And our winner is Aaron Ong from Bandar Seri Begawan, Brunei, who will be receiving an Armani's men's watch from Italy. Answer the following question to win a short-wave radio and other Deutsche Welle prizes! Which Asian city will host the 2008 Paralympics? To be entered in the prize draw, please send your answers and your postal addresses to us at myasia@dw-world.de or to Deutsche Welle Radio, Asia English Department, Kurt-Schumacher Straße 3, 53113 Bonn, Germany. The draw will take place at the end of the month and the winners will be informed on our radio programme Asia Compact and on this site. Good luck! In May, we asked you about 'Sushi'. The right answer is, of course, a japanese rice-based dish. The winner of the radio is Ms Tayyaba Noor, from Muzafargarh in Pakistan. Congratulations! And Moumita Khanom from Kurigram, Bangladesh, Fariha Afrreen from Hyderabad, India, Fru Glory Zii from Bamenda, Cameroon, Min Lin from Jabar, Indonesia and Siv. Chun Ly from Ho Chi Minh City, Vietnam--all get consolation prizes. Thanks for participating in the quiz this month. Groove Zone is holding a celebrity competition! At the beginning of every Groove Zone, listeners can hear celebrities "showing up at the red carpet." But perhaps you're tired of hearing about David Hasselhof and Paris Hilton? We need your help with some new names! Who would you like to hear showing up at the red carpet ahead of Groove Zone? If we like your entry, you'll win a prize, and your suggestion could be incorporated into the beginning of Groove Zone. * Send us some names of people who you'd like to hear show up at the red carpet before Groove Zone. Be creative  the most interesting answers will be selected! * Entries must be received by August 18th. Winners will be announced on the August 23rd edition of Groove Zone.